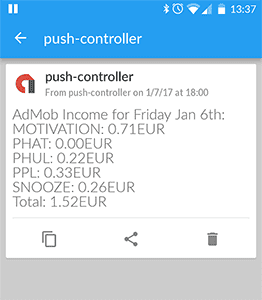 I wanted to send a daily report of my apps’ AdMob income to my phone using the PushOver notification service, but couldn’t find any (working) examples to fetch the Google AdSense (+AdMob) revenue using Node.js and Express.js. For most other languages there are code examples, but not for the Google-API-NodeJS-Client - we will change that. We will use the google-api-nodejs-client and authenticate through OAuth. I assume you already set up a Web application at the Google Developer Console, added the AdSense Management API and created the credentials. (You can create a localhost credential for testing purposes.) Download the credentials as a .json file (clientsecret*.apps.googleusercontent.com). The Getting Started guide describes how to do that. Create a new project and install the dependencies with npm install --save express googleapis. We will use Google OAuth for Authentication in our Express.js app. Therefore, we need to define the scope of our access (adsense.readonly) and provide a path (/auth/google) that redirects to Google’s Consent - Grant Access - page. When the user confirms, Google passes the authentication tokens as parameters to a callback path defined as in the credentials file (redirect_uris). Don’t worry, we only need to authenticate manually once to receive a refresh_token. We save it and can then always request fresh access_tokens when these expire. config.redirect_uris,  // may NOT be an array. Otherwise, the consent site works, but silently fails in getToken. Once your client is authenticated and has its tokens set, you can start fetching your revenue data using the adsense API of googleapis. Updating expired access_tokens if necessary is handled in oauth2Client.getAccessToken(callback). You can customize the query by specifying start and end dates, or split the total earnings into the individual Ads by providing a dimension. For playing around and figuring out how to use the AdSense API, the documentation provides a useful form. // Send error per push notification, E-Mail etc. // Send report per push notification, E-Mail etc.